I like to think I'm creative. I don't claim to be an artist, merely a creator. Over the years I've created everything from stage sets to lamps, fireplace fronts to photographs. 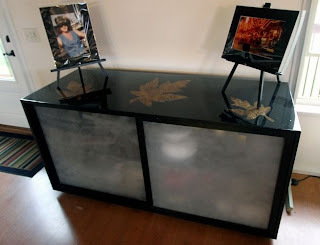 Recently I’ve become interested in the "upcycling" movement. Right now I'm not selling pieces but I'm thinking that might be something for me to work into, so I'm kind of branching out in what I'm creating. This site is where I will share some of those things with whoever cares to take a look… let me know what you think. I picked up something different at a flea market yesterday, so my next project has begun... but you'll just have to wait a bit until I get it done before I can tell you more. In the meantime, let me throw out here a piece I finished up last year. Unfortunately, I have to admit this one was not made of upcycled materials. This was a new cabinet for the first floor of my home. I live in a rather unique home, the first floor is entirely open, just one big room. There's a catwalk that goes across the room from above, connecting the bedrooms on the higher floors. Partly because of that open format, the kitchen area is low on storage. The new cabinet allows me some extra room for bowls, the food processor, crockpots, etc. 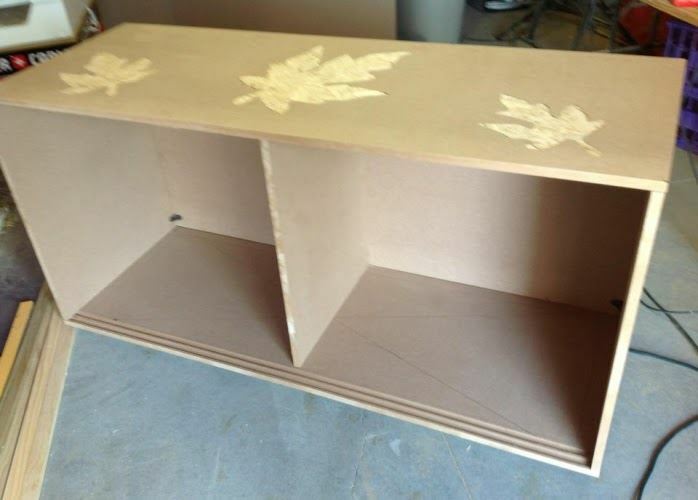 Most of the cabinet is made from simple MDF board. I intentionally didn’t use real wood because I wanted it to be a very smooth surface without any grain. The leaves are stained a medium color, providing a hard contrast with the black in the rest of the piece. I routed out the shape of the leaves into the top of the cabinet so that they fit in flush to the surface. The whole top is then covered with an epoxy resin. Finally, the “glass” is plexiglass that I sanded on one side to provide the opaque look. Always looking for an adventure. I love it when I drive off for one location, get lost and end up somewhere entirely different. I'm a widower and my (only) daughter is in grad school meaning more of my time is my own. I'm enjoying life by doing whatever pops into my head and sounds like fun. Over last four years I've bought a home and continue to work on it, gone skydiving, ran a marathon, taken acting lessons, gone on a couple of decent size road trips and countless short ones, flown a kite in 20 degree weather on New Year's Day, devoted time to my photography and a whole lot more.